Pizza for supper is a must for me at least once a week or every 2 weeks mainly for the convenience. 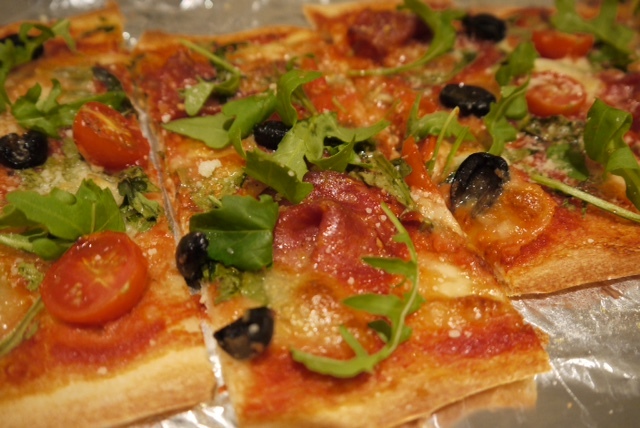 When you have had a hard days work you come home and you want dinner to be ready in less than half an hour, frozen pizza always a good option for me on those lazy days. 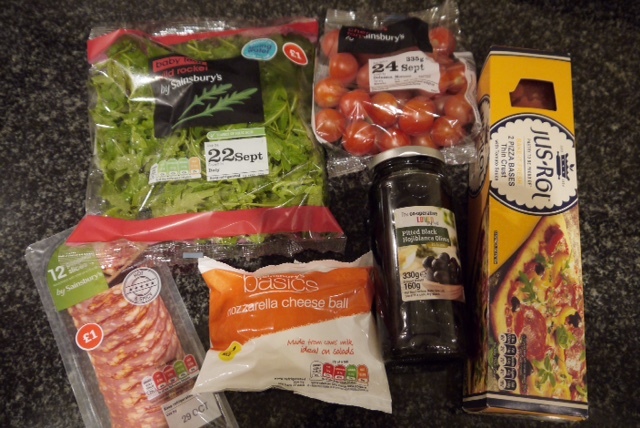 The other week when shopping around in our local supermarket I came across the Jus Roll thin crust pizza base. 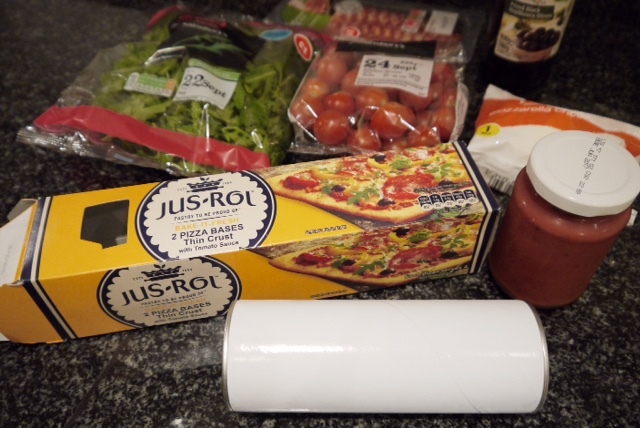 I am a huge fan of Jus Rol products and in the past I have written about their Apple Danish, Cinnamon Swirls and Croissants. 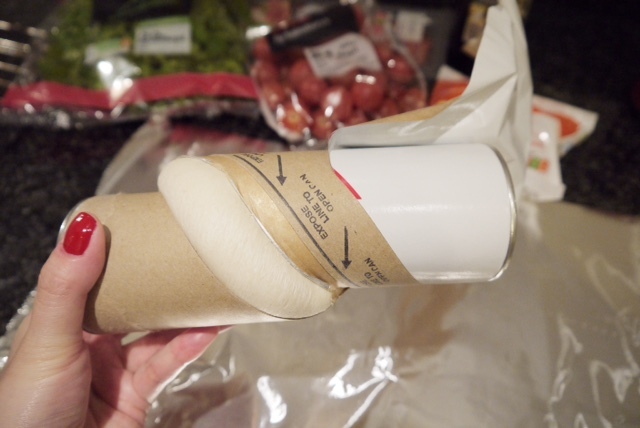 Everything in their range is so delicious and easy to make! 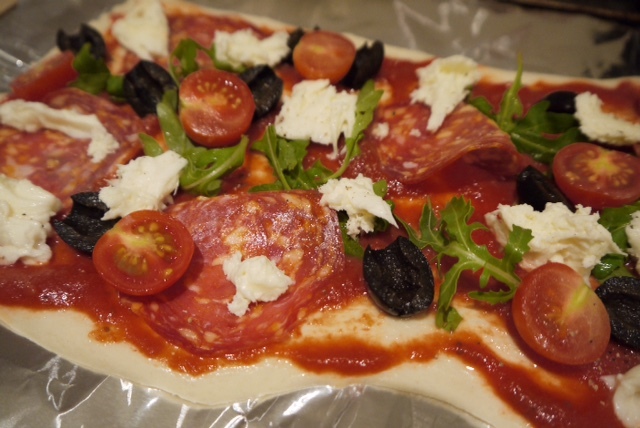 Anyway back to the pizza I decided to try this stuff out and make our own pizza on Sunday night. 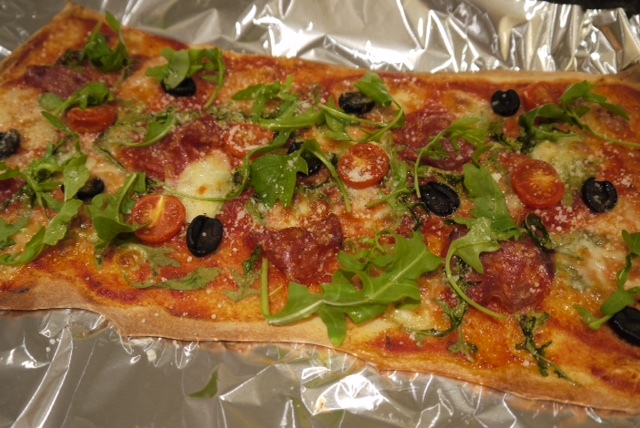 I went for a simple one with tomatoes, rocket, pepperoni, mozzarella cheese, olives, truffle oil and a sprinkle of Parmesan when it comes out of the oven. 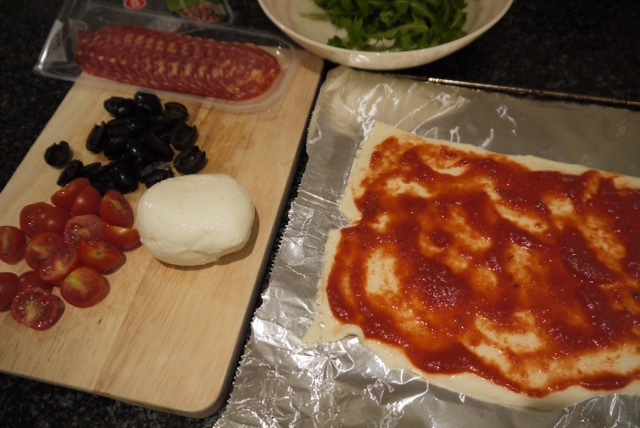 The pizza set comes with 2 bases in a tin (see above) and a jar of tomato sauce for the base all very convenient. 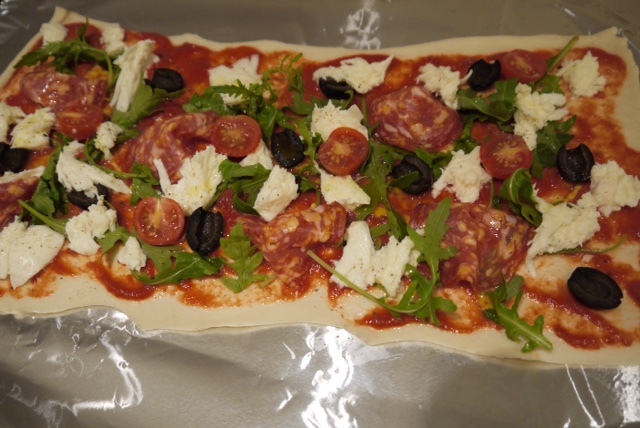 Just take the base out of the packaging and roll it out, it's not sticky so don't worry about using flour etc... Once both bases are laid out you can add all the ingredients on top and put it in the oven for 15 minutes until it looks crispy / cooked. 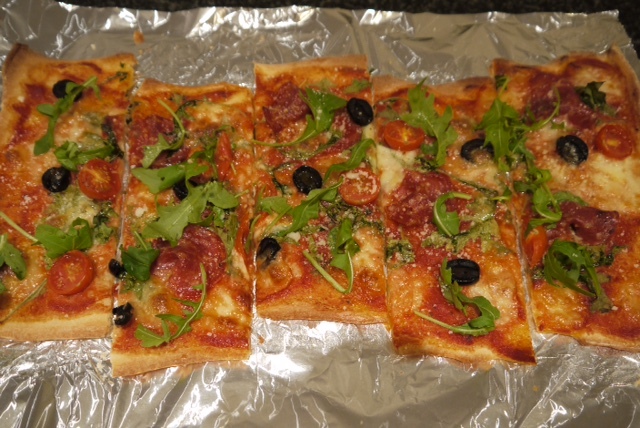 When it's ready I sprinkled some fresh rocket on top along with some Parmesan and sliced it all up ready to serve. 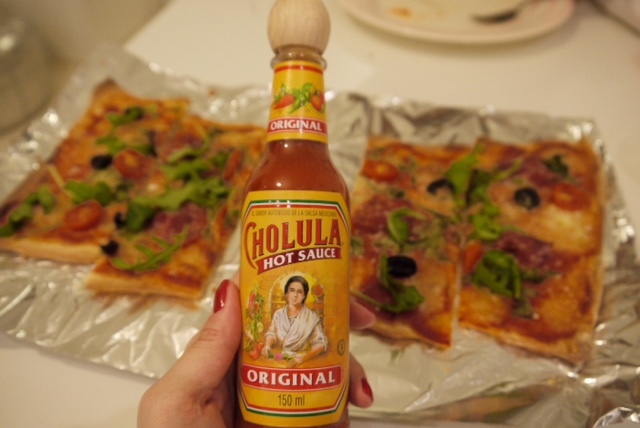 Hubby likes dipping his pizza in Cholula sauce but I prefer it as it is. Dinner ready in less than 30 minutes including prep time! I am unsure if this is healthier than frozen pizza but it tastes delicious and I would definitely make it again. It's perfect if you have friends over and you are making a few buffet style dishes to share out. 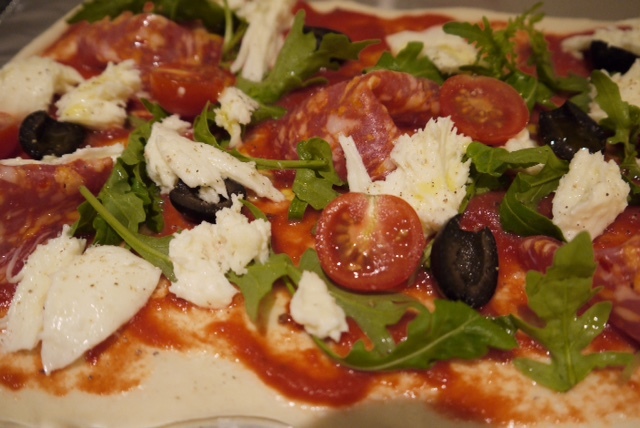 Have you made your own pizza's before, what is your favourite topping and what base etc do you like to use? 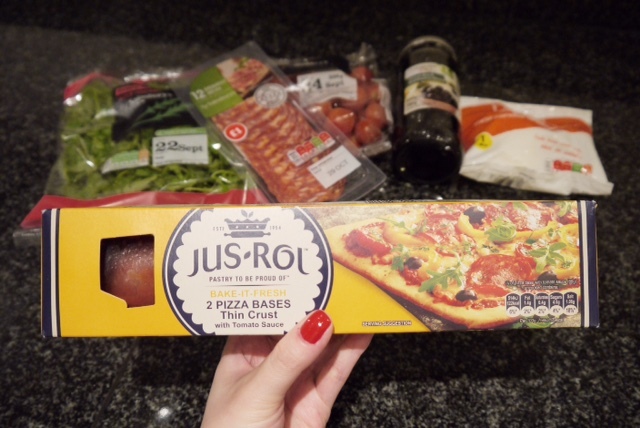 I saw the jusrol pizza bases in Sainsbury's last week and wondered if it was any good! might have to pick up some next week, it looks delicious! J won't go back to eating oven pizza's now...what have I done!